I have experimented with many framing options over the years: a decade ago I taught myself how to use a miter saw and joining tools, and I was making my own frames out of fine cherry wood molding. 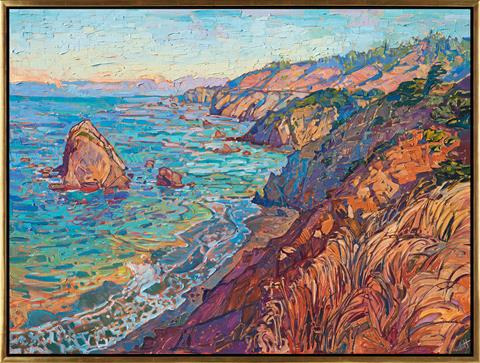 I have framed my work in simple floater frames, traditional plein air frames, and elaborate baroque frames. 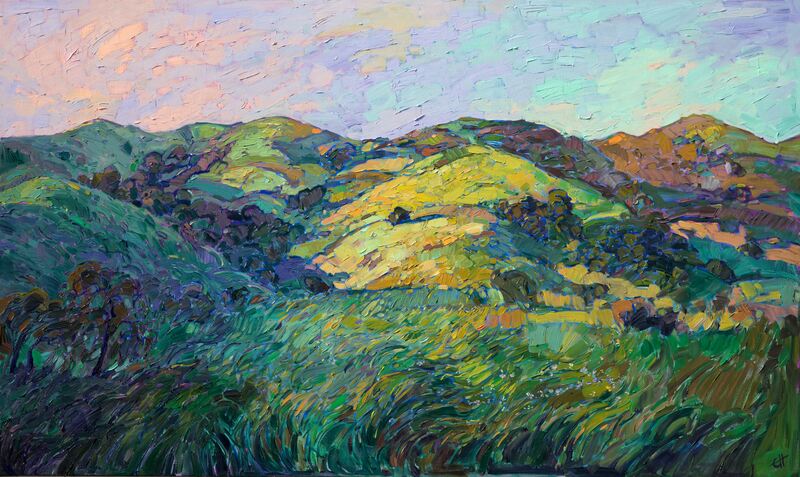 I have hung hundreds of paintings without any frame at all, letting the artistically-finished edges stand uncovered for a more contemporary look. 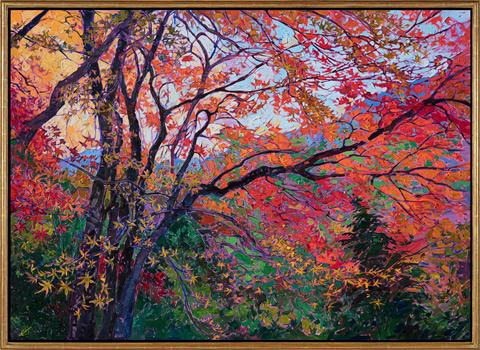 A few years ago I developed a new style of frame that I call an "open impressionist frame," which you can see on the painting above. I like this frame because it is a beautiful blend of the contemporary and the traditional, as I consider my painting style to be as well. 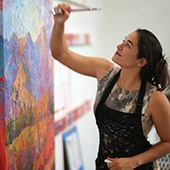 I want to give you a brief overview of the framing options I offer for my original oil paintings, which you can see by scrolling down. 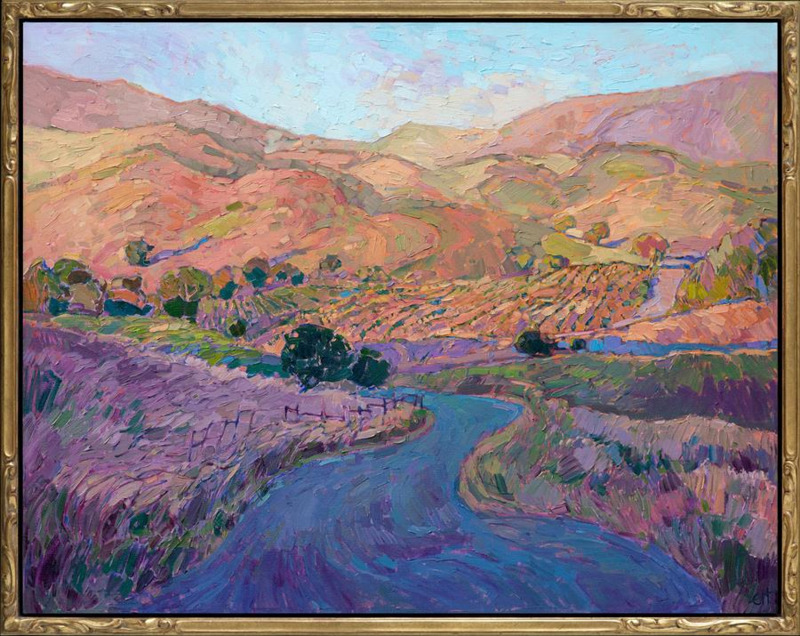 However you decide you want to frame your painting, I will help to make sure the color and style complements your original work of art. 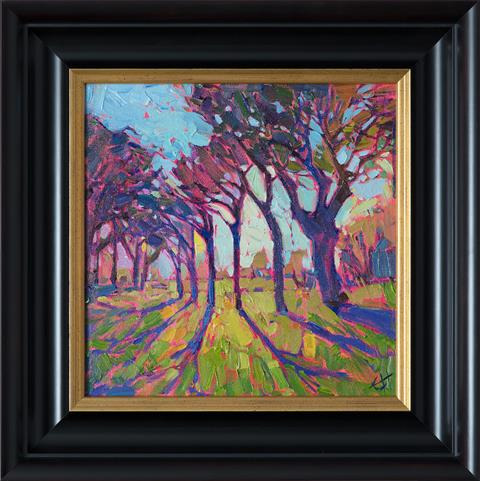 Framing is always included without extra charge when you buy an original oil painting. I designed this frame to be a blend of the classic and the contemporary. 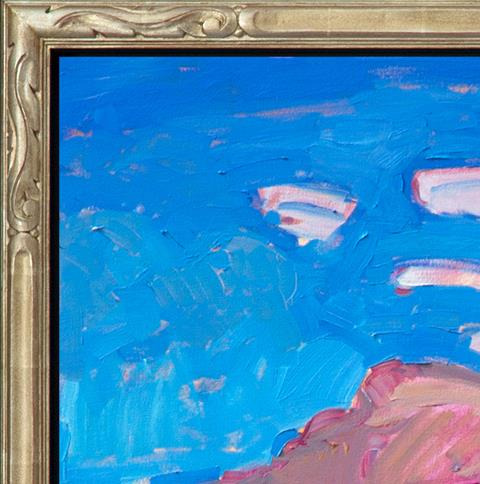 This is a floater frame, which means the painting floats inside the frame and lets you experience every brush stroke on the surface of the canvas. 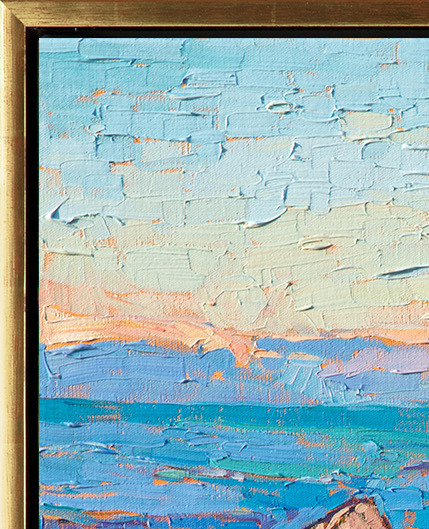 There is a small gap around the edge of the painting that lets you see a bit of the painted edge. 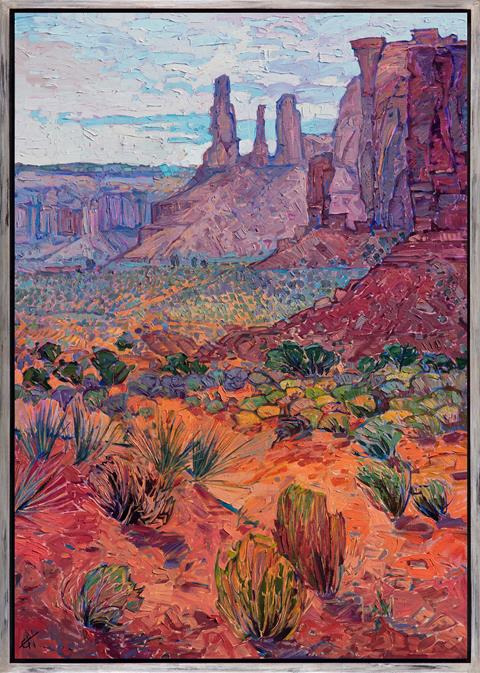 Each frame is hand-carved by a local master craftsman and finished with a corner pattern inspired by the Taos School, Early California, and American Impressionist frames. The frames are then gilded with 23kt yellow gold or 22kt champagne gold. 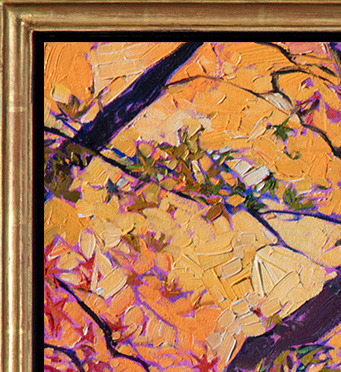 Using different colors of clay as the ground beneath the gold leaf, I am able to create a range of gold hues. 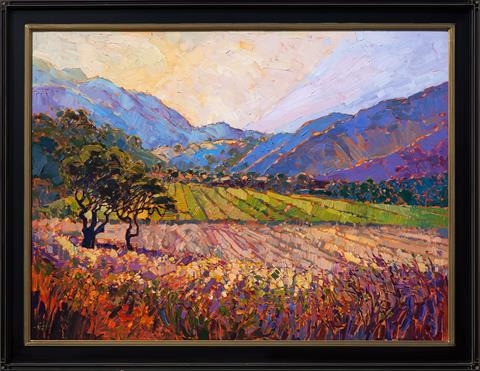 Each open impressionist frame is choosen to complement the colors and pattern of the original oil painting. I can also order a custom frame just for you, depending on your preferences. This simple, uncarved floater frame was very popular with my collectors, until I used up every last bit of molding from the only supplier in the U.S. I then decided to have my own molding manufactured, and as of now I am again offering this style of framing for my paintings. The EH Gold Floater is finished on the top with antiqued 23kt gold leaf. The face of the frame is 1/2" wide, and the sides of the frame are finished in pebbled black enamel. This frame is classy and modern. 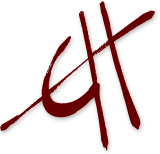 This is a fancier version of the EH frame, with a scalloped molding and a curved profile. These frames are hand-made and hand-gilded in genuine gold leaf. These frames have a classic and elegant look. This is another hand-made frame that is designed for homes decorated in cool tones. If you have cool-toned walls and silver accents, this is the frame for you. I named this frame the "RH" frame because it goes great with Restoration Hardware decor. The RH Frame is finished with sterling silver, with a warm rub applied over the silver, making it look more antiqued. 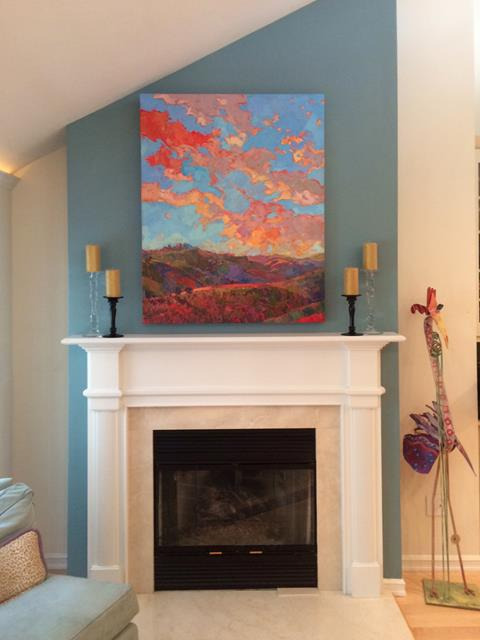 Many collectors prefer to hang their paintings unframed against a white wall or on an accent wall that complements the colors in the painting. 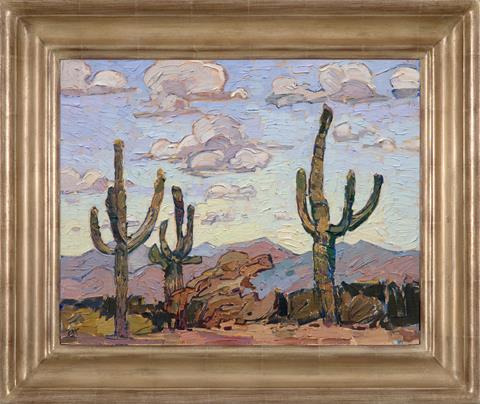 In this example, the whole wall is acting as a frame to the painting. Since I always paint the sides of my canvases (which are 1-1/2" deep) as a continuation of the painting, you get to experience a neat illusion and three dimensional effect as you approach the painting from the side. 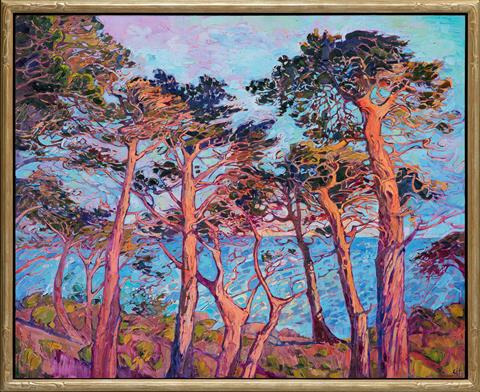 Triptychs should be hung unframed, 1-2" apart, since a frame would add a hard line that would distracting from the painting. Traditional frames are designed for canvases that are 3/4" deep. They come in a variety of gold, black or wooden finishes. These frames can be custom ordered for you upon request. Any of my deep canvases can be re-stretched onto 3/4" stretcher bars so they will fit these frames. 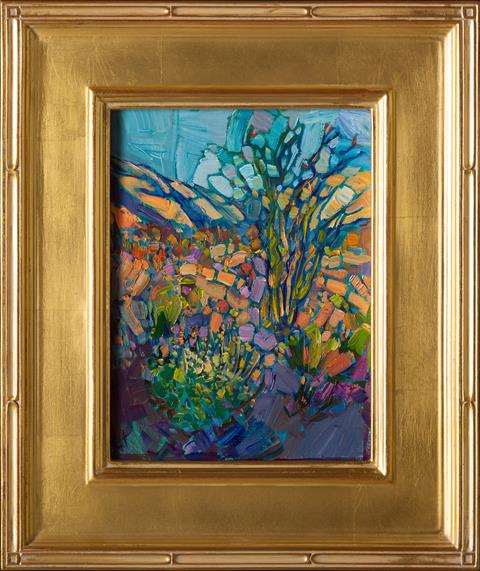 I offer several styles and colors of frames for my petite paintings under 20". 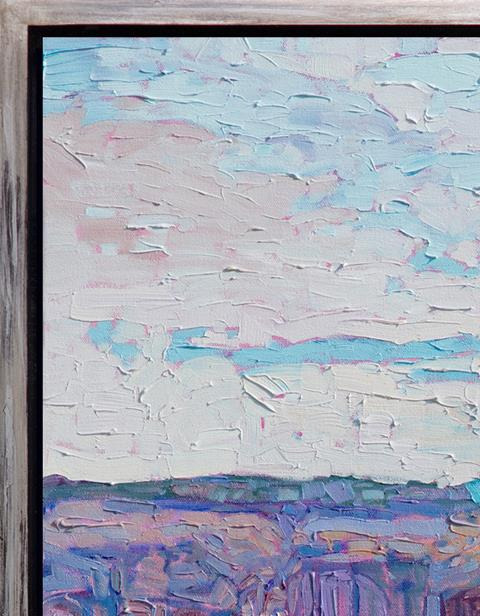 My petite paintings are all done on linen boards, so they will fit in any traditional or plein air frame.